The 4 Disciplines of Execution (4DX) is a simple, repeatable, and proven formula for executing on your most important strategic priorities in the midst of the whirlwind. By following the 4 Disciplines.Focusing on the Wildly Important; Acting on Lead Measures; Keeping a Compelling Scoreboard; Creating a Cadence of Accountability.leaders can produce breakthrough results, even when executing the strategy requires a significant change in behavior from their teams. 4DX is not theory. It is a proven set of practices that have been tested and refined by hundreds of organizations and thousands of teams over many years. When a company or an individual adheres to these disciplines, they achieve superb results.regardless of the goal. 4DX represents a new way of thinking and working that is essential to thriving in today.s competitive climate. 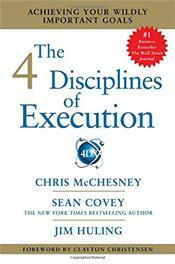 The 4 Disciplines of Execution is one book that no business leader can afford to miss.